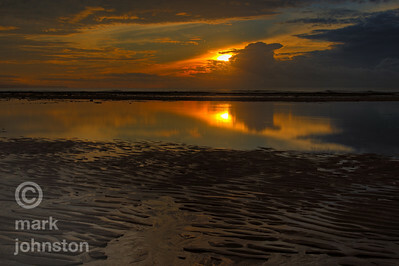 Bali lies east of Java, about eight degrees south of the equator, and is the westernmost of the Lesser Sunda Islands. 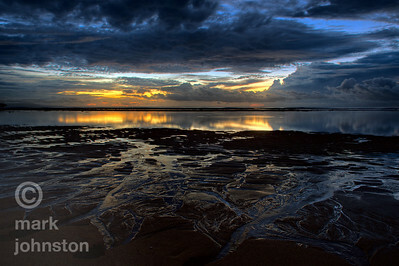 It is one of Indonesia's thirty-three provinces. The island spans about 153 km (95 mi) east-to-west and 112 km (69 mi) north-to-south - although the slow traffic makes it seem larger! The highest point is Mount Agung at 3,142 m (10,308 feet) high, an active volcano that last erupted in March 1963. Mount Batur (1,717 m/5,633 ft high) is also still active, last erupting in 1999-2000. 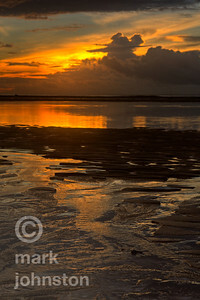 Sunrise at Sanur on the southeast coast of Bali. 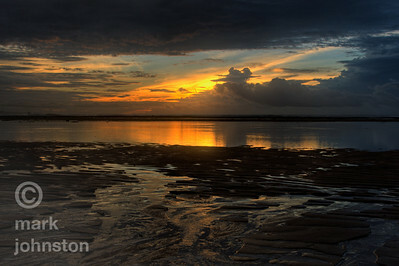 At low tide in this area, water draining off the beach leaves interesting shapes in the foreground, while a shallow lagoon inside the surf line reflects the distant clouds and brightening sky. 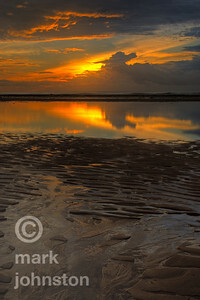 Sunrise at Sanur on the southeast coast of Bali near high tide. 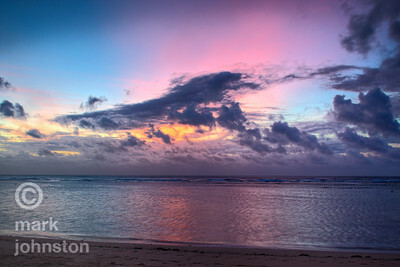 Solid cloud cover to the east obscured the sunrise, except for a short period where a band of pink shot up from behind the clouds, illuminating the morning sky and announcing the arrival of Sol. 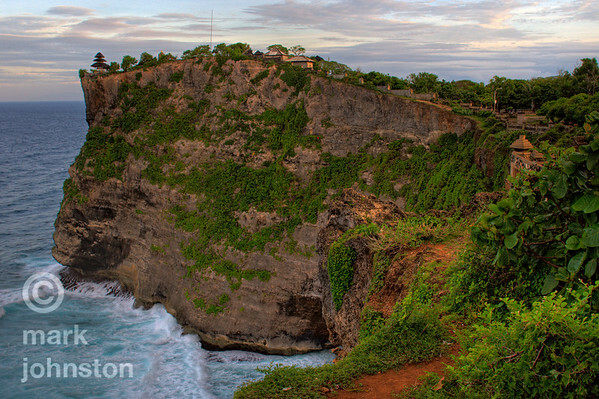 The temple at Pura Luhur Ulu Watu perches on the very southwestern tip of the Bukit Peninsula in southern Bali. A temple was first established here in the 11th century. 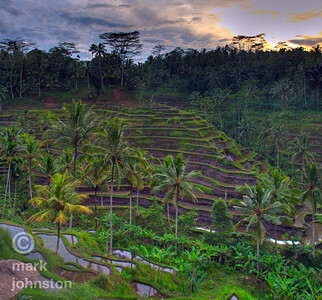 Terraced fields near Ubud at sunrise. Lake Batur, below the eastern flank of Mt. 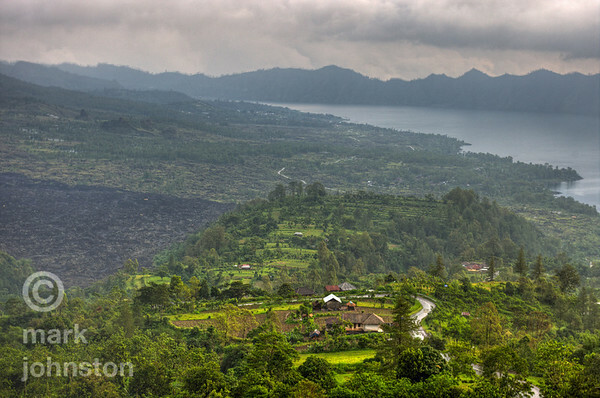 Batur, one of Indonesia’s more active volcanoes - last eruptions were in 1999-2000.